Tuberose is trumpet-shaped blooms bearing a similarity to stars and looks very close to stephanotis. It is a beautiful flower for weddings and is generally harvested throughout the year and offered in white and other lovely colors. The tuberose is a beautiful white flower that is specially cultivated for its long-lasting flower spikes. The flower is popular and used for ornamental purposes. The scent of this flower is amazing, and it's even has a long vase life. One can see why this flower is so popular. The beautiful tuberose comes in a few varieties namely single and double. The double array is always in high demand because the scent is two folds better and is used extensively in high-grade perfumes. If you want to know more about this fantastic flower and it uses read on. The tuberose is a one of a kind flower, native to Mexico. From there it started spreading to different parts of the world somewhere during the 16th century. It makes it one of the earliest plants to be cultivated. But it’s probably extinct in its natural habitat by now. The Aztecs were already growing it six hundred years ago. Once this flower was introduced to Europe, it quickly became popular. It was a part of the moon garden which is a collection of pastel and white flowers that have a beautiful fragrance after dusk. The flower lost much of its charm when it was widely being used in funerals. However, the Victorian ladies still loved these gardens since they didn't go out in the sun to maintain the prestigious milky white complexion. Tuberose successfully grows in pots, garden borders and beds and is widely cultivated for its various other uses. The tuberose is extensively used as a cut flower, and many aesthetic floral arrangements can be made from them. They make amazing ornamental bouquets and part of centerpieces. Individual flowers provide a lovely scent to bouquets and can be made into fragrant boutonnieres. The flowers are very much valued for their aesthetic beauty and fragrance. They are elegant and attractive. The tuberose blooms all year round, with star-shaped flowers that are waxy and loosely arranged around the bed of long spikes. The flower is especially popular for its strong fragrance and the essential oils it releases and its many ornamental uses. The single tuberose variety is more strongly fragrant than the double variety and is used in making high-grade perfumes. The double variety, however, is extensively used as a cut flower. The tuberose has gained a lot of momentum in the country. It's sweet honey like fragrance has especially become a favourite of all. The white tuberose has become a wedding favorite nowadays for obvious reasons. These ivory flowers are sweet smelling and easy to not only pair with other flowers but also alone. The flower with its long spikes makes magical centerpiece arrangements. But using them in bouquets has recently caught on. These flowers look amazing paired with garden or spray roses of ivory and pastel colors. This makes a stunning hand-tied bouquet perfect for any garden or boho chic wedding theme. The white tuberose represents sensuality, and the scent of the flower is said to help with emotional problems as well. Adding them to your centerpieces and bouquet arrangement becomes even more meaningful then. Apart from using them extensively in cosmetics and perfumery, these flowers are used in wedding bouquets and centerpieces. The white tuberose flower looks stunning as an accent to other ivory blooms in a classic white wedding bridal bouquet. They can be added to the bridesmaid's bouquets too and can also make excellent boutonnieres. The white tuberose adds intriguing texture to floral arrangements. When paired with other smaller blooms like chrysanthemums, alstroemerias, and delphiniums they make an effective, boho chic and rustic centerpiece. These can be a perfect addition to waterfall bouquets too. Their star-shaped petals make them very attractive and intriguing amongst other blooms. 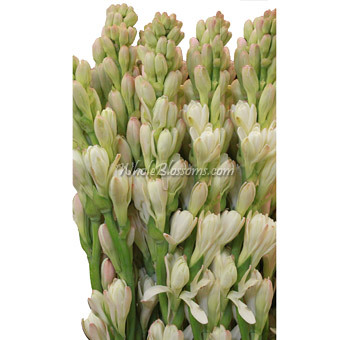 Tuberose flowers are available widely throughout our country. You will find them with many vendors, florists, and wholesalers. But we suggest that you make sure you're making a purchase from a vendor that does justice to the freshness, quality, and price of the flower. That's why we recommend the renowned Whole Blossoms cut flower wholesalers. They easy to navigate online website will cater to all your flower needs. They can provide you with bulk tuberose flowers. If you do, then order fresh tuberose flowers for sale from Whole Blossoms only. They deliver these fresh blooms right to your doorstep and even have a 24/7 hour delivery system! It's a severe luxury for wedding planners, floral designers and do it yourself brides. There's no need to go around town from florist to florist when your fresh blooms are available to you at just a click. Check out the wide variety of flowers from all over the world!